The island of Puerto Rico was discovered by Columbus in 1492. It was a colony of Spain until 1898 when it was invaded by the United States. 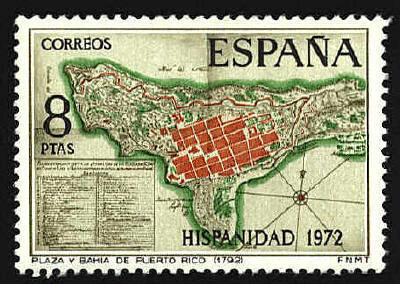 The stamp shows the square and bay of San Juan, Puerto Rico as it appears on a map from 1792. Near the end of the first century, under Augustus, the Romans captured the town of Salduba and established a military camp. The name of the camp was Caesar Augustus, Saraqustah in Arabic, and Zaragosa in Spanish. 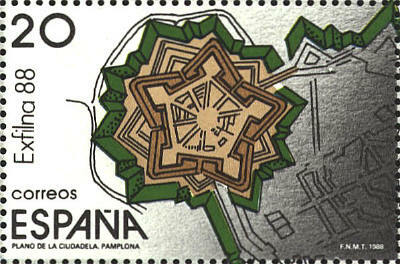 The Roman camp at the site of Zaragosa is shown on the stamp. The Cardo Maximo and the Ducumano Maximo, the major intersecting streets of the camp are identified. The muralla is a section of the wall that enclosed the camp. Several architectural landmarks from the period following the expulsion of the Moors from Zaragosa in the twelfth century are also indicated. Mosaicos indicates the presence of mosaic pavements; Toro is the central square; Teatro is the theater; Pilar is short for Cathedral of Our Lady of the Pillar, 1681; Seo is the twelfth century Catedral de la Seo; PET, PIEDRA, the seven arched bridge over the River Ebro, built in the mid-fifteenth century; Lonja, the palace of the Counts of Luna, also fifteenth century. 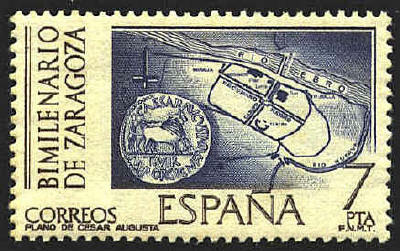 The stamp was issued in 1975 to celebrate the second millennium of Zaragosa, the capital of Zaragosa Province in the autonomous community of Aragon, Spain. Las Palmas is the capital of Las Palmas Province and the largest city of Gran Canaria Island in the Canary Islands. It was founded in 1478 at the mouth of a ravine, and named for the palm trees that were abundant there. Las Palmas was the headquarters for the Spanish conquest of Tenerife and La Palma Islands, and later was an important supply base for Spanish ships headed for the Americas. Christopher Columbus' house is found in the colonial quarter. The map is based on a plan of the town drawn in 1590 by Leonardo Torriani, Descrittione et Historia del Regno de L'Isole Canarie. In 1515 Navarra became a kingdom with its own institutions and laws under the Castilian crown. In 1571 the Ciudadela or Fortress of Pamplona, the capital, was built on the Pyrenean border. In the 19th century French troops captured the Fortress by trickery and remained until 1813. 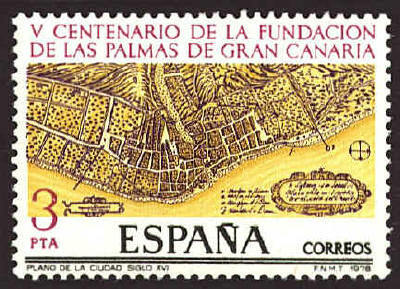 The souvenir sheet was issued in 1991 to mark the 500th anniversary of the end of Islamic power in Spain. 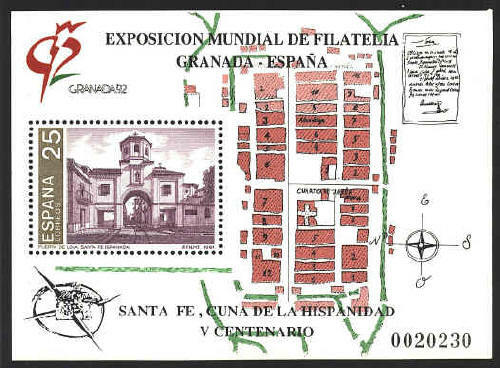 and to recognize the World Wide Philatelic Exposition in Granada, Spain. Ferdinand and Isabel set up camp in 1483 at the start of the Siege of Granada. In 1491, in a period of 80 days, they converted the camp into a town of brick and mortar, surrounded by a wall and a moat, Santa Fe. The structure of the town is that of a Roman camp built round two straight roads that cross at the center. The four gates to the city can still be seen today. The contract between the King and Christopher Columbus was signed here on 17th April 1492.